Oasis Solutions had the distinct pleasure of participating in the 2018 ITA Fall Collaborative in San Diego, California. The conference unites leaders of the IT profession, offering interactive sessions about leading industry trends and successful business practices. 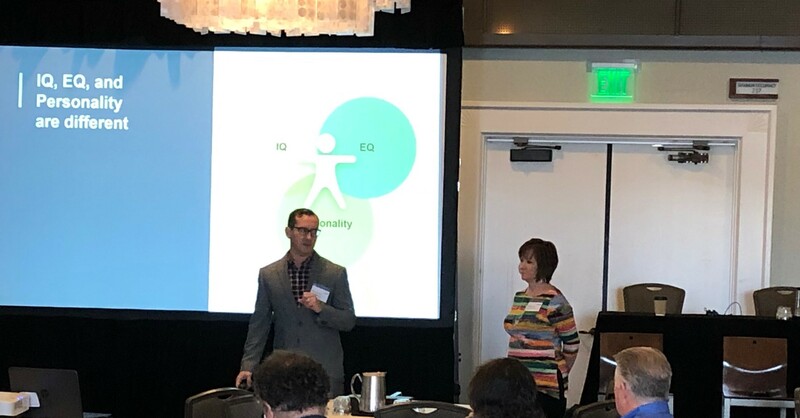 For their breakout session, Annette Manias, President & Founder, and Aaron Rosenberg, Partner & Senior Vice President of Business Development, presented on the importance of leveraging emotional intelligence in the workplace to elevate your organization’s level of success. Reflecting on the experience, Aaron Rosenberg provides his key takeaways from the event. “It was an overall great conference that included memorable and rewarding sessions, keynote speeches, and networking events. One that specifically stood out was a breakout session hosted by Bob Green of SingerLewak. He provided the group with information about his business processes and explained how he assists clients in setting up their ERP implementation projects for success. Bob offers consulting services to organizations that are interested in changing systems, helping them evaluate software providers and partners by building requirement documentation and selection criteria to enable them to achieve the maximum value out of their conversion project. It opened up a great dialogue among attendees on how we market our services and attempt to provide successful outcomes to our customers. Bob provided great insights into the right way to approach a new implementation project and purchase of our services. The good news is that his process closely aligns with the Oasis Analysis process. It is comforting to know that we are providing a comparable service to our clients, helping them understand the importance of great people and great processes prior to purchasing software. There was an informative Q&A panel with Gartner Analytics providing content revolving around the growth and state of the cloud ERP marketplace, segmented by industry. It was enlightening to see the statistics supporting our everyday experience of witnessing how businesses of all sizes in varying markets are leveraging cloud-based software to improve operational efficiency and boost productivity. Self-awareness is being acutely aware of your emotions as they are happening and recognizing how they affect your actions. Self-management is using that awareness of your emotions to positively manage your behavior, deciding when and how to act. Social awareness is picking up on the emotions of others, perceiving what they are thinking and feeling and how that might affect them. Relationship management is using your understanding of personal emotions and the emotions of others to manage connections over time. “As a small but growing firm, we’ve found culture fit to be paramount in identifying the right talent to fill positions. We believe it’s not just what we bring to the table. It’s who. A synergetic and cohesive team is the foundation supporting the quality of service that we are able to provide to our customers. Beyond our own experience, emotional intelligence has been linked to performance. Companies with employees demonstrating higher EQ interactions have better retention rates and higher engagement which can lead to increased revenue. Those who exhibit lower scores are often less efficient and experience turnover. An understanding of emotional intelligence is not a fix-all solution but should be equally considered when implementing your organization’s strategies for employee training and development. Retaining the best talent for your business starts with hiring the right individuals to begin with. EQ offenders in the workplace can negatively affect other employees’ levels of commitment, creating situations of avoidance and disruption, eventually leading to disengagement or resignation. Avoiding crucial recruiting mistakes reduces costs and headache, saving you time and money. Evaluating emotional intelligence can be a key factor In helping you determine whether an individual is a right fit before devoting additional resources and bringing them into the folds of your organization. “From our conversations at ITA, we gleaned that most people were familiar with concepts such as self-awareness and relationship management, but weren’t actively implementing EQ assessments into the hiring process. A candidate’s degree of emotional intelligence can be a powerful predictor for how they will interact and ingratiate with the rest of your team. Leaders should consider introducing related interview questions to evaluate levels of competence in the four core skills. We learned that one particular firm attending the session was already prioritizing EQ in this way. They asked behavioral questions to determine how an individual dealt with situations such as an unhappy customer or a colleague not holding weight in a project. Their observations showed the more a candidate had to rely on hypothetical reactions for their responses rather than recalling actual instances based on personal experience, the higher the possibility that they weren’t self-aware enough to recognize when it happened to them. Other red flag possibilities were that they didn’t have the experience of encountering and overcoming interpersonal challenges or simply weren’t willing to reveal when they may have made a mistake. Probing to uncover these potential issues can boost the effectiveness of your hiring process in identifying the right talent for your organization.